The Bulk SMS marketing service is by far the best and indeed very efficient way of sending the messages offers to your prospective or the existing clientele. Bulk SMS marketing is also really cost-effective and also ensures that reaching your customers is very convenient. The SMS is by far one of the most effective communication modes. Over two billion messages are sent across every month and in the years to come, the emerging markets are only going to increase the number of the messages and the growing usage of this wonderful communication form. The SMS service providers are making big money due to the booming trends in the short message texting. The Bulk SMS marketing is the most direct form of the form of marketing that is readily available to the marketing professional in today’s world. An SMS sent to a mobile device has a 99% chance of being read which really ensures an open rate that is the highest among all the available marketing methods. This leads to a five times higher response rate compared to mail marketing for example. The best part is that the Bulk SMS marketing is real cost effective. SMS testing is significantly very cheaper than any other messaging system. The Direct marketing using the SMS costs up to 80% less. Bulk SMS Marketingis in its nascent stage and not many businesses around the globe are very actively promoting their business using this method of the communication. As such, the reach and the effectiveness and the brand recall for this form of messaging is much more than any other modes of communication. Highly targeted SMS texting can be highly reachable and is really very effective form of marketing. Bulk SMS marketing leverages the bottom line of the businessin a tremendous way. When successfully and very efficiently done, it increases the sale of the products and increases the bottom line. Since, the messaging drives can be set up in a short notice a huge amount of unsold inventory can be sold within a small time. An efficient and cost effective way to ensure targeted direct marketing is the use of Bulk SMS. Not only does it help in the acquirement of new business, but help in further improving the relationship with existing customers and those with the business prospects. This is one of the most effective ways to further augment your other marketing drives and even lead the initiative. 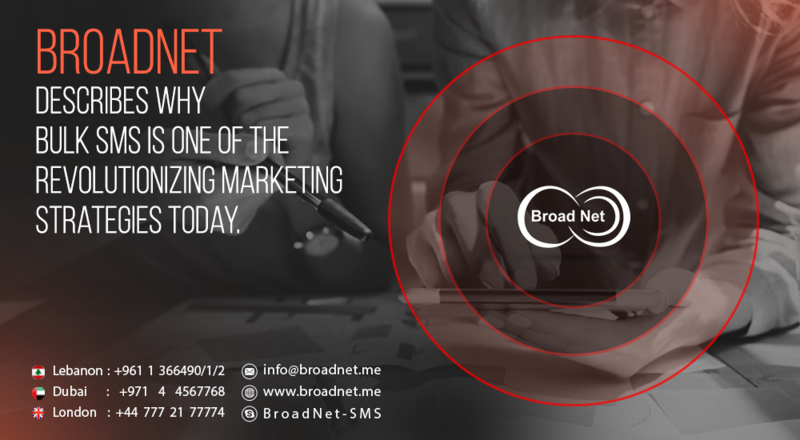 BroadNet organizes and carries out hard-hitting SMS Marketing campaign that can assist you in targeting a larger number of customers at the destined time without breaking a hole in your pocket. To ensure actually how, please visit our website www.broadnet.me.